Very few people in the wine business want to talk about politics. It's bad business, because they want to sell wine to both Republicans and Democrats. I love to talk about politics, and I've been talking to people in California wine country for a long time. But I'm not about to bust anybody for conversations they may have thought were off the record. People could get fired if their name were to show up in a blog post supporting a candidate -- any candidate. I'm not Donald Trump; I don't wake up in the morning hoping to say, "You're fired." So this post is about generalities, not specific people. The wine industry cares more about immigration than most, and on the whole is very pro-immigration. The industry cares about environmental regulations, but there is no unified stance: plenty of people are disdainful of the government's ability to write sensible laws. Everybody would come together to fight more sin taxes on alcohol, but the powerful distribution arm of the wine industry likes red-tape regulations on distribution and sales, and so do some of the largest wineries because they realize it gives them an advantage. The overwhelming majority of winemakers in California are Democrats. This makes sense, as they are scientists. Because of this, the media and to a lesser extent the public gets the sense that the California wine industry is strongly Democratic -- something Napa Valley Vintners would not like you to believe, as Republicans buy a lot of expensive Cabernet. In the media, we exalt winemakers, often too much (yes, me too.) Statistically, winemakers don't have that many votes, nor do they donate much money. Maybe the wine industry does lean Democratic, because California does in general, but it's not a landslide. Read on. This is the most complicated and interesting category. I don't usually like absurd food-wine pairing stories (what wine goes with ramen? what wine goes with Swedish fish?) but this actually happened this week: I was offered a wine-pairing challenge, and I accepted. My friend Liz lives in Oakland near Berkeley. But she sides with the Berkeleyites: she doesn't have a TV. And naturally she's not from Berkeley; nobody is. She's a lifelong Chicago Cubs fan, which means this is her best year ever. Seriously, Cubs fans, who even needs television? Since its debut at the 1939 New York World's Fair, television has not shown the Cubs celebrating a championship. Bad TV! In fact, radio, which goes back to 1916, hasn't handled one either. The last Cubs title was announced, literally, by men climbing tall buildings holding signs. But Liz wanted a TV this week because she wanted to watch the All-Star Game, with the National League fielding an all-Cubs infield. Rather than fly to San Diego, which she considered, or buy a set and hook it up to Dish Network, she opted for the cheaper alternative of coming to my house with a Chicago dog assembly kit she ordered from Vienna Beef in Chicago. An ordinary hot dog is not a difficult wine pairing. It's sausage: wine goes with sausage. Mustard and onions, no problem. 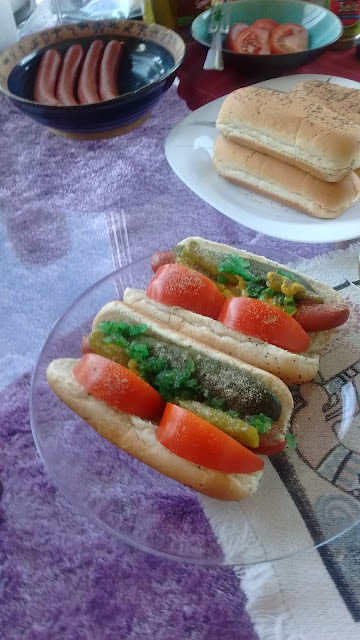 (Adults should not put ketchup on a hot dog.) Cheese and chili, fine. Sauerkraut -- I was recently in Alsace, we can work with that. But a Chicago dog is a Level 5 Wine Pairing Catastrophe. I had two invitations in late June. I could go to Italy to taste wines from a couple regions I really enjoy. Or I could go to northwest Idaho to visit a brand-new AVA and taste wines from just five wineries, none with any tradition. Naturally I picked Idaho. Mi dispiace, Italia! I have a fascination with Idaho wines. The climate and soils are, in many places, similar to Washington wine country: conducive to good grape growing. Global warming might reduce the frost risk, the biggest hazard in Idaho. There's little wine culture yet, but it's one of the most promising states for the future.